We’ve been eyeballing wall-mounted vases for a while now. They are such classy and simple accessories that easily fill small spaces with interest, and bonus – you can switch out the flowers or other fillers as often as you’d like. 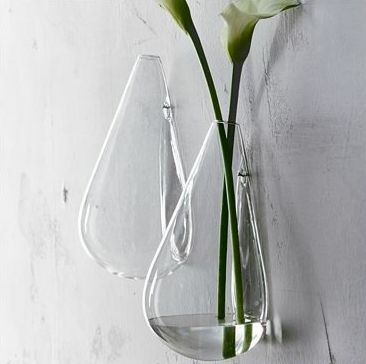 There are lots of big box versions out there – we especially like these tear drop vases that will run you an easy $4.95 each from CB2. Luckily before we rushed to the store, the DIY light bulb went off. You can drill through wood, steel and tile – so why not glass? 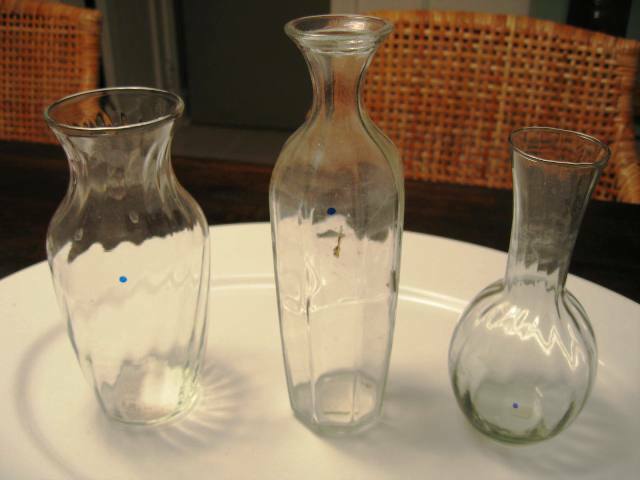 A quick trip to Goodwill produced 3 small vases for a total cost of $2.16 and a much more eclectic look then you’ll find with a store-bought set. 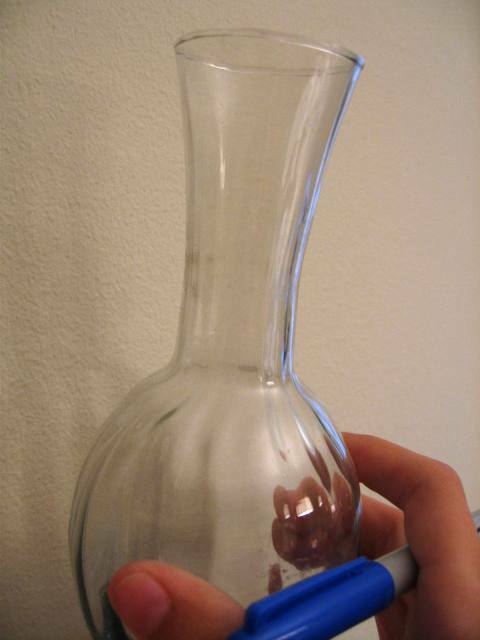 Look for vases that are not made of super thin glass, but also aren’t really heavy. Sounds like a tough combination but when you’re sifting through discount vases you’ll realize what we mean. The only other step in this quick and easy project is to drill small holes in the vases so that they can be mounted to the wall on a nail. Because all of your vases may be shaped differently, just hold each one against the wall to determine the best location for mounting. Once your holes are marked with a permanent marker, use a drill bit made specifically for glass and tile to drill your holes. You can find these in any hardware store for about $10. We used a 3/8” bit made by Bosch. The pointed end kept the bit from skipping around the surface of the glass. It is important to use just the right amount of pressure when drilling through your glass. The thicker the glass the less likely you are to break your vase. The most important tip is to have patience! Drilling slowly will keep you from breaking the glass, but it will also take a few minutes depending on the its thickness (We found this out the hard way – enter one spare vase from under the kitchen sink). 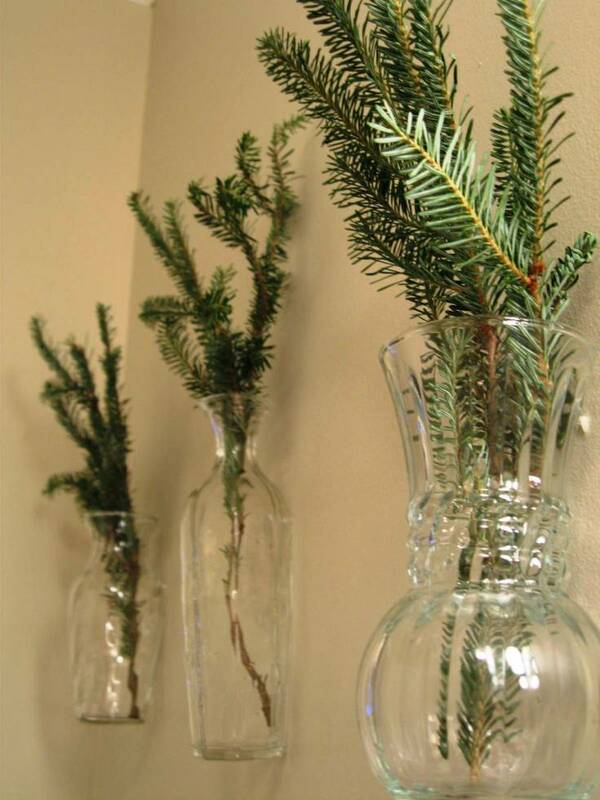 Once your holes are drilled just clean your vases and mount them to the wall with a small nail and fill with your favorite blooms. 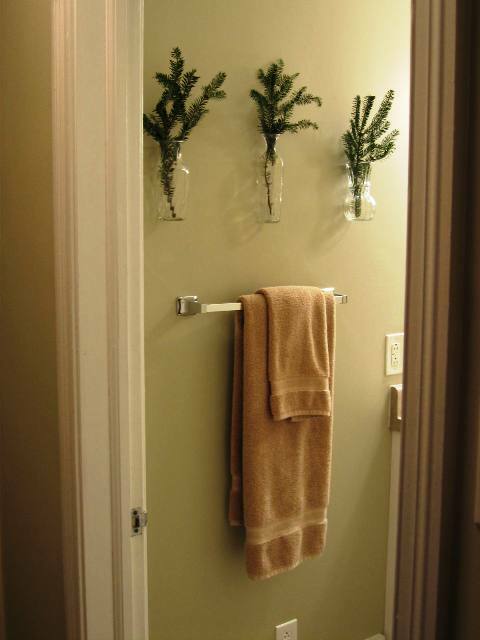 In keeping with the holiday spirit we’ve added tree trimmings to our vases that are now hanging in our guest bathroom. $2.16 (we already had the special drill bit) gave us a completely unique set of wall vases that we’re sure no one else has in their home. We’re pretty proud that there was only one casualty in our first glass-drilling experiment.